Antioxidant abundant dark chocolate and whole food multivitamins are now available from True Healthy Products, an all natural nutrition company, to help counteract cell oxidation and slow the body’s natural aging process. True Healthy Products, an all natural nutrition company and proponent of healthy eating habits, now promotes healthy dark chocolates and whole food multivitamins that can help counteract cell oxidation and slow the body’s natural aging process. Antioxidants found in natural foods and some dark chocolates are commonly believed to counteract cell oxidation or cell death which is part of the body’s natural aging process. Youthful bodies can quickly replace damaged or dead cells, but with aging, this cell replacement process slows. Antioxidants can speed this process up again, which may help to slow the overall effects of aging. According to the company, a common trend with many shoppers is preventative health through good nutrition with a cornerstone in the consumption of antioxidant rich foods like the healthy dark chocolate, “The Doctors Chocolate” which is featured in the company’s “Simple Chocolate Diet”. 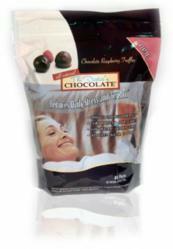 True Healthy Products’ “The Doctor’s Chocolate” is one of several antioxidant rich items in their product line. The formulator of this healthy dark chocolate is Dr. Keith Scott-Mumby who received his formal medical training in the UK. He went on to take a special interest in food allergies and nutrition and has written several popular books on these subjects to help thousands of people simply by changing their diets. In addition to healthy dark chocolate, you can consume a diet rich in fruits and vegetables to help counter cell oxidation and the effects of free radicals. Typically, the fruits and vegetables with the deeper colors contain the higher amounts of antioxidants. The company's all natural whole food vitamin “9 A Day Plus” is also full of antioxidants to arrest cellular aging, probiotics for digestive health, and the nutritional equivalent of 100% of RDA (Recommended Daily Allowance) of fruits and vegetable requirements.